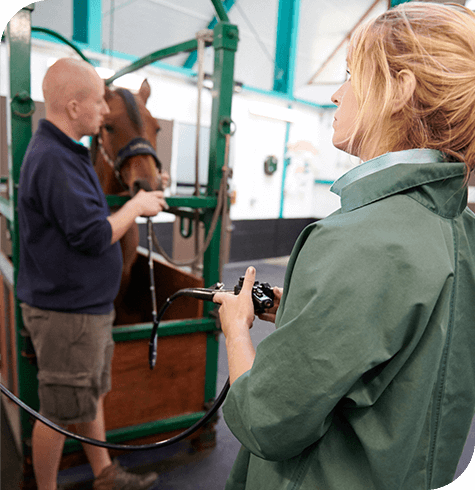 Gastroscopy is the gold standard method of diagnosing gastric ulcers in horses. Equine gastric ulcer syndrome (EGUS) is a common condition which can affect all horses; however symptoms can be subtle and are not unique to EGUS. At Aireworth Vets, we have the equipment to allow us to carry out the procedure both at the practice or at your yard (if facilities are suitable). The procedure requires the horse to be starved for 12-24 hours so that the stomach is empty; this allows for an effective assessment of the stomach lining. Gastroscopy is carried out under sedation and is only a short procedure. If you would like to discuss gastric ulcer syndrome, please contact the office to speak to one of our vets.